The Pacific Islands are the islands of the Pacific Ocean. 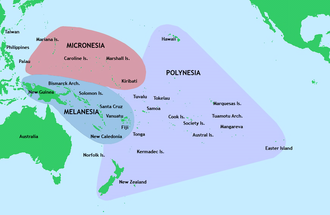 Three major groups of islands in the Pacific Ocean are Polynesia, Micronesia and Melanesia. Depending on the context, Pacific Islands may refer to countries and islands with common Austronesian origins, islands once or currently colonized or Oceania. The indigenous inhabitants of the Pacific Islands are referred to as Pacific Islanders. This is a list of many of the major Pacific islands, organized by archipelago or political unit. In order to keep this list of moderate size, links are given to more complete lists for countries with large numbers of small or uninhabited islands. The umbrella term Pacific Islands may take on several meanings. Sometimes it refers to only those islands covered by Oceania. In some common uses, the term "Pacific Islands" refers to the islands of the Pacific Ocean once colonized by the British, French, Spaniards, Portuguese, Dutch, United States and Japanese, such as the Pitcairn Islands, Taiwan, and Borneo. In other uses it may refer to islands with Austronesian linguistic heritage like Taiwan, Indonesia, Micronesia, Polynesia, Myanmar islands, which found their genesis in the Neolithic cultures of the island of Taiwan. Islands of the Pacific Ocean proper, with an area larger than 10,000 km2. British Columbia, Canada (many islands). All of Canada's Pacific islands are located in the province of British Columbia. Vancouver Island is Canada's largest Pacific island. ^ D'Arcy, Paul (March 2006). The People of the Sea: Environment, Identity, and History in Oceania. University Of Hawai'i Press. ISBN 978-0-8248-3297-1. Archived from the original on 2014-10-30. Retrieved 14 December 2014. ^ Compare: Blundell, David (January 2011). "Taiwan Austronesian Language Heritage Connecting Pacific Island Peoples: Diplomacy and Values" (PDF). International Journal of Asia-Pacific Studies. 7 (1): 75–91. Retrieved 2 May 2015. Taiwan associations are based on almost forgotten old connections with far-reaching Pacific linguistic origins. The present term Austronesia is based on linguistics and archaeology supporting the origins and existence of the Austronesian Language family spread across the Pacific on modern Taiwan, Indonesia, East Timor, Malaysia, Philippines, Singapore, Brunei, Micronesia, Polynesia, the non-Papuan languages of Melanesia, the Cham areas of Vietnam, Cambodia, Hainan, Myanmar islands, and some Indian Ocean islands including Madagascar. Taiwan is in the initiating region.